Okay, so, I know y’all have heard me talk about my human, and how she’s my best friends in the whole world… And those of you who have known me a while have probably also heard me talk about Leo, my best friend at my last barn. And since I’ve moved to my new barn, I’ve told you a lot about Zii, William, Troy, and Bruce, some of the friends I’ve made here. Yup, that’s Rocky the Kitty! What a Rockstar. 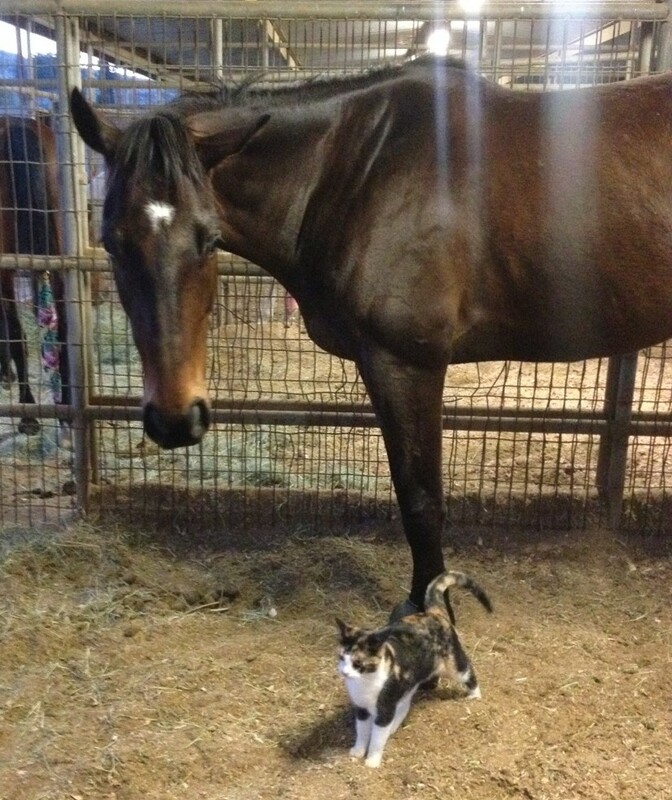 I met Rocky the Kitty shortly after I moved to my new barn, the place I now call home. I noticed that Rocky the Kitty was always lounging around somewhere – on the table, in a tree, on the John Deere Tractor – and I liked him instantly for that reason. What a laid back barn cat! Now, I have heard rumors that he isn’t so great at catching mice, which is what a barn cat’s job is supposed to be… but you know what I always say: live and let live! I mean, if given the choice, I’d much rather have my humans provide food for me, too, than to have to go out and catch my own. Granted, it’s a lot easier catching grass than it is catching mice… Not that I’ve ever tried to catch a mouse, that is. Anyway, when we first met, Rocky the Kitty was a bit wary of me. You have to understand, he’s around horses all day; he’s heard all the best lines about “Wanting to hang out sometime,” and “It’s okay that I’m bigger and stronger than you, we can be equals in our friendship,” and all that. But to my knowledge, none of the other horses ever really followed through. Well, over the past few months since I’ve been at this barn – and in particular, the last two months while I was “out of commission,” so to speak – my humans have been stopping by anywhere from 1 to 3 times each day. The days that they come by more often, there’s usually a visit (or two) where we’re the only ones at the barn. During those times, Rocky the Kitty began coming over and hanging around in our general vicinity. He’d say hello and whatnot, but he would mostly just keep to himself… while staying pretty close by. Gradually, he began to come closer and spend more time actually hanging out with us! He tried to be sneaky about it at first – like how he hides in the bushes sometimes – but we all welcomed him into our little family with open arms! You don’t have to hide, Rocky! Come hang out with us! Once Rocky the Kitty and I became friends, we grew pretty close, pretty quickly. He always comes running over whenever he sees me out of my stall, and he just chills with my humans and me. He even follows us around, if we’re on the move! I had the day off today, just like I thought I would. Mommy came to the barn in the morning to get me out of my stall, take off my standing wraps, let me stretch my legs and let me eat some grass. Rocky the Kitty came with us and we made our way out to my favorite patch of grass. Chillin’ with my best friend. Rocky hung out and waited patiently on the tractor until I was ready to move to another patch of grass. So, after eating that grass for a while, we decided to move a little further and check out another patch with lots of clover. Rocky said that he was just going to chill on the mounting block and sing for a little while. He really likes to sing. And he’s really good at it, too! I made sure to tell him what a great singer he is. I think we all need a bit of affirmation now and then, you know? And that’s really what being a friend is all about – offering your friends support and encouragement! Well, that and sticking up for each other against bullies. I know I’m bigger than Rocky, but he has claws and he’s always willing to stick them out to protect me! Anyway, after he was tired of singing, we just hung out in silence and watched the birds go by. Well, Rocky the Kitty watched the birds go by. I just ate as much grass and clover as I could! All in all, it was a pretty awesome morning, just hanging out with Mommy and my best friend, Rocky the Kitty. I stayed in my stall all day because it was supposed to rain, but Mommy came back in the evening, as per her usual. Okay, Mommy. I’m done. Let’s go! And do you know what it was, that was so much better than being turned out in the round pen? Being turned out in a GRASS PADDOCK! That’s right, friends. I got to go out in a grass paddock for a couple hours tonight! I was by myself, but the paddock was HUGE and had LOTS of really, really sweet clover. Plus, there were horses in the paddocks near me, so I didn’t even feel worried or alone. Look at all this grass! How am I going to eat it ALL in only a couple hours?! Mommy stuck around for a while to supervise me, just to make sure that I wasn’t going to gallop around and be too silly for my own good, like I sometimes do when I’m excited. But I knew better this time. I trotted and cantered a little, but then I just put my head down and got to eating! Once they saw that I was going to relax and stay calm, Mommy knew they could leave me alone and let the new barn manager, Jenna, bring me back inside when I was finished eating the grass. They waved goodbye as they were leaving, and Mommy said that she’ll be here in the morning to ride! Jenna brought me in a couple hours later, took off my boots and checked me over to make sure I was still in one piece. Now I think I’m ready to hit the shavings and get some shut eye! I have to have lots of energy tomorrow morning when Mommy gets here for my workout, because I want her to know that I’m back in the game! I’ll be sure to let y’all know how it goes! Last winter, I lived in the warm and sunny Miami, Florida. Even though I lived in New York before that, and Virginia before that, spending last winter in Miami is probably the reason why I don’t feel like I’m used to all of the rain we’ve been getting lately. I think I can actually count the number of days that it rained in Miami last winter on all four hooves. It’s not that it was pouring today or anything, but the skies were gray and cloudy and the air was damp. It would drizzle now and then – enough so that we had to stay in the little paddocks with the shelters – and once or twice it rained a little harder for a while. Needless to say, I didn’t get to work today. My Mommy said that was okay, though, because she was planning to give me today off either way. For the most part, today was uneventful. Leo and I got to share the big field that’s connected to a little paddock with a shelter, but neither of us really felt like going into the shelter. Leo actually likes to stand in the rain, and I just like to hang out with Leo. Our friends Isis, Moekie, and Jelly Bean and Jube Jube each had their own little paddock and their own shelters, too. My Daddy came out a couple different times during the day to bring us all hay, which he put into the shelters for us. 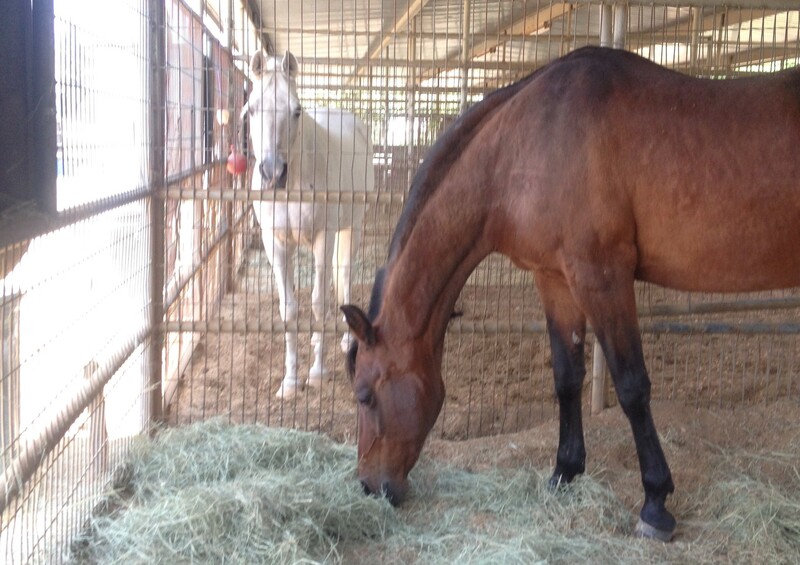 Since it wasn’t raining at that time, my Daddy put some hay outside for me to eat while Leo ate his inside the shelter. I think Leo got lonely, because he came outside and walked over to where I was eating my hay. Now, Leo doesn’t like to share his hay, so when he eats in the shelter, I stay away because I don’t want him to try to bite me or kick me. But Leo asked me if I’d mind sharing my hay with him. I thought about it for a minute, and then I decided that it was fine. I mean, he is my best friend, after all. So I told him it was fine, and we shared a pile of steamed hay outside on the grass. I love having a best friend to share hay with on rainy days. I’ve had a lot of best friends in my life (remind me to tell you sometime about my best friend in New York, a Palomino named Cooper), but I’ve never had a best friend like Leo. He’s the best best friend I’ve ever had. Oh, did you guys hear a lot of fireworks last night? We heard a bunch of them, but they didn’t really scare us. I mean, if my friends had been scared, I’d probably have been scared, too. But we weren’t, we just kept eating our hay and ignored all the loud noises. 6. I resolve to come up with new cute and silly faces that will convince my humans to give me more treats. Oh, and my Mommy said that I should also resolve to stop untying shoes and stealing hats… but I’m not too sure about those ones yet. Untying people’s shoes is really fun! I’d love to hear what your “New Year’s Resolutions” are, too! Whatever they are, work hard at them and I’m sure they’ll come true. Happy New Year, friends.